BIRTH OF A NATION « THE BRYCE IS RIGHT! – An Islamic state America helped to create. Despite America’s fears of Muslim terrorists in the Middle East, we are witnessing the birth of a new nation which is a rare occurrence. 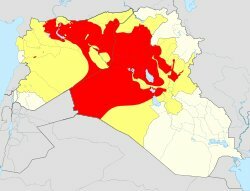 Fostered by ISIS, the Islamic State in Iraq and Syria, it will undoubtedly be a Muslim country consisting of fanatical extremists who will claim land within Iraq and Syria, and possibly beyond. They have long range plans to seize land in Lebanon, Israel, Palestine, Jordan, Cyprus, and Southern Turkey. Although they will be rebuffed by these countries, they will need to get their house in order and settle their country first. Behind this, of course, is the issue of religion and oil. ISIS is a Jihadist militant group who, if successful, will develop a Sunni Muslim state operating under Sharia Law, a radical notion to westerners. As such, it will become a magnet for Islamic militants and a threat to peace in this tinderbox part of the world. As to oil, ISIS has already overrun several fields, but currently has no means to develop wells and get the crude to market. What is needed is access to the sea, either through Syria to the Mediterranean or through the Iraqi southeast to the Persian Gulf. Turkey and Iran are much too strong to allow ISIS to pass, nor would Israel and Jordan. No, ISIS will have to fight its way through Syria or Iraq in order to access the sea. It is also likely ISIS will try to capture Baghdad, either by force or by siege. This ultimately defines their battle strategy. If they fail to break through to the sea, their movement will collapse. ISIS considers Mr. Obama a weak president who does not want to put boots back on the ground in Iraq. He may rattle some swords but reinserting troops into Iraq is out of the question. Instead, the president will likely offer intelligence, military leadership, and air strikes. The loan of heavy weapons like tanks and canons is unlikely as it may fall into rebel hands. Historically, America has not been successful in developing countries in our image. Only the Philippines comes close to following the American model. In contrast, Great Britain excelled in building an empire which included North America, Australia, India, South Africa, and many small islands, for a total of 53 countries in today’s Commonwealth. Iraq was an experiment to see if we could instill democratic principles in the Middle East, a foreign concept to that region which has primarily been ruled by monarchies and dictatorships. The idea of three separate but equal branches of government is unfathomable to this barbaric part of the world. The United States would have been better off conquering Iraq, seizing the oil fields, and ruling the nation until such time Iraqis demonstrate they possess the desire and temperament to accept democracy. Thus far, they haven’t. By deserting the region, America has left a shaky country prone to takeover. By March 2013, the total cost of the Iraq War was estimated to have been $1.7 trillion by the Watson Institute of International Studies at Brown University. A total of 4,486 US soldiers were killed in Iraq between 2003 and 2012, and this does not include our Allies participating in the conquest. Now we are about to lose everything there including our new billion dollar embassy. Maybe it will become the capitol building for the rebels. Supposing the ISIS state comes to fruition, the next question is who will they ally themselves with, America or Russia? Frankly, neither as they despise both countries. Instead, they will become a belligerent independent state much like Cuba, Iran and North Korea, and will suffer from the same type of U.N. economic sanctions. They will have few allies in the area. Keep in mind, the long range objective of ISIS is to dominate Iraq, Syria, and beyond. They are well armed, well financed, and very determined. When American troops pull out of Afghanistan later this year, the government will likely fall to al-Qaida, thereby creating a similar fanatical Muslim state and putting Iran in the unenviable position of being wedged between Afghanistan and Iraq. Although it is unlikely, should Iran decide to broker an alliance between radical Iraq and Afghanistan, such a coalition would threaten peace and oil production. This would represent a genuine threat to Pakistan, Saudi Arabia, Turkey, and just about everyone else in the region. It is not in America’s best interests to allow ISIS to develop itself into a nation, nor the world’s. However, since we have already withdrawn American forces from Iraq, we may have little to say about preventing ISIS from creating a new state. None of this would matter had we adopted a policy of energy independence, but that moment has passed and we are still dependent on Middle Eastern oil. Let us not forget, few countries are born without bloodshed, including America. The situation in Iraq will become much worse before it gets better. America can either become a helpless bystander or actively involved. Americans may be tired of the conflict there, but we have too much invested, both in the past and in the future, to allow a new radical country to emerge. LAST TIME: YOU CAN PUT YOUR EYE OUT THAT WAY – What would the 4th of July be without fireworks?